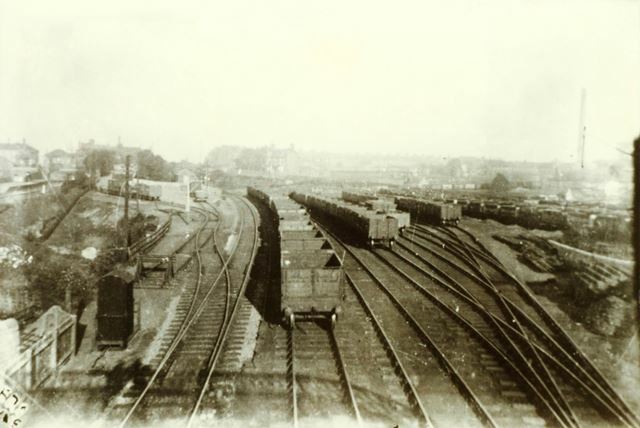 Looking towards Southgate Colliery (on the right of the photograph with the tall chimney). The North Midland Railway reached Clowne by 1888 with the opening of the Clowne and Mansfield branch off the Staveley line. Clowne had two railway stations, one built by the Midland Railway Co. the other, by the Lancashire, Derbyshire & East Coast Railway. Both lines are no longer with us, but the site of the trackway became the Linear Park. The old Midland station clock which is, oddly enough, an LDECR one (!) and came here from Fledborough Station, is still in existance and attached to the side of Station House. The Midland Railway station building still exists as does the old booking office, on North Road. The former LDECR station booking offices are visible from near Clowne's War Memorial (used for many years by a bank).